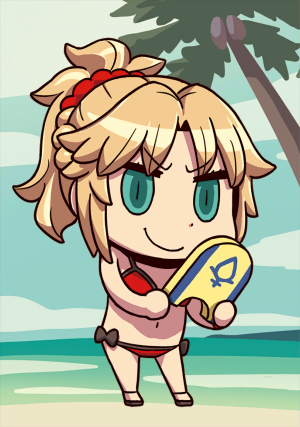 This article is for the 4★ , Mordred. 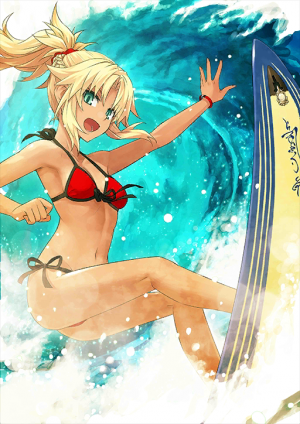 For the 5★ , see Mordred. Increase your Arts Card effectiveness by 5%. Increase your Critical Star Drop Rate by 5%. Overcharge: Chance to decrease Charge for all enemies. Increase party's NP damage by 20% while she's on the field. 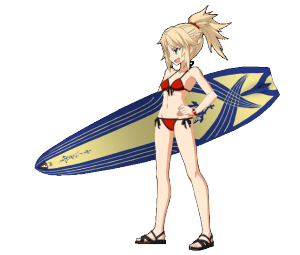 And so the Super Ultra Surfer, Mordred Bikini Style is born! In short, you can call her SurMo, or Surfer Mo. 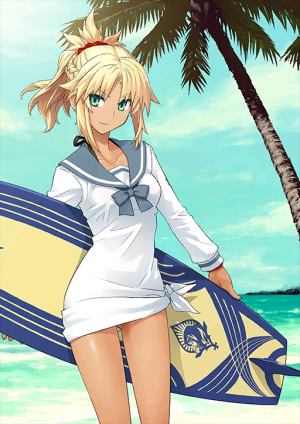 Since she's been summoned as a Rider and not a Saber, she doesn't have Clarent with her. She doesn't even have her helmet and armor! As she's excited, she's a bit more good-natured than usual. Surfer Mo's constantly excited because it's summer. 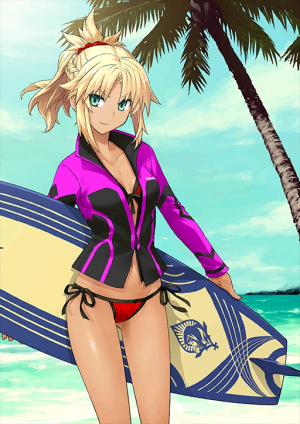 Her troubles with her father and questions about her self identity have been set aside, and is trying whole-heartedly to enjoy her time at the beach. Kingly Mood of Reining in Surging Waves! Ramming the opponent head-first with a tube riding (that thing in which you run through the gap of waves), which boasts top-class degree of difficulty among the surfing techniques by means of Prydwen. While in the middle of it, she feels exactly like a king that rules the sea; or something like that. Miss Surfer Mor pushes out her spoiled front and good will towards the Master more than usual. Due to her tension raising as far as it could raise thanks to the summer heat, seems like her habitual moodiness has been abandoned somewhere. Upon being summoned, she sought for a surf board that could withstand her power and ended up cheekily stea... borrowing to perpetuity one from her father's treasure vault. Its name is "Prydwen". According to legends, it is a wonder tool that could become both a ship and a shield, or something like that. In the words of King Arthur -- who said you could turn it into a surf board?!. 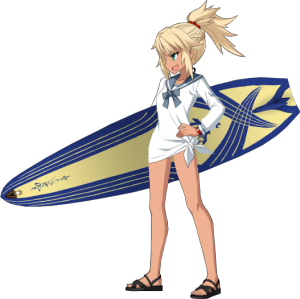 Miss Surfer Mor is lively during summer, but she feels depressed during fall and hits rock bottom at winter. Thus, for now the Master should just keep her company patiently, reassuringly, even during fall and winter. She should notice eventually. That the door to summer, lies right beside her. 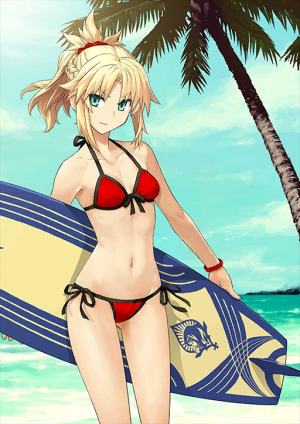 As you can see, a super ultra surfer who was born in a burst of laughter - Mordred, bikini-style. For short, Miss Su-Mor, or rather Miss Surfer Mor. Due to things being so festive, she is displaying a more soft-hearted side. 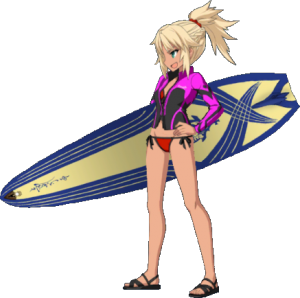 Since this is summer, Miss Surfer Mor has a higher tension than usual. Leaving the antagonism with her father and her own raison d'être aside for the moment, she wants to enjoy the summer sea to her heart's content. 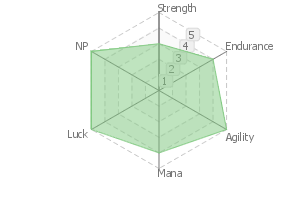 She gained NP generation buff on 17 August 2016. This page was last modified on 29 January 2019, at 08:38.